What is the definition of so close, but so far? When astronomers discover a rocky earth-like exoplanet, located in the habitable zone of a star that is not just in our neighborhood, but right next door. An international team of astronomers discovered the planet orbiting Proxima Centauri the closest star, other than the Sun, to the Earth. A mere 4.2 light years away. Their results are being published today in Nature, and this news is changing the world of astronomy, not only because its so close, but because its existence suggests Earth like planets may be literally everywhere in our galaxy. 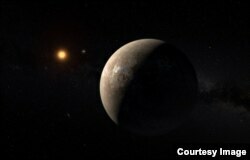 Artist's impression of the planet orbiting Proxima Centauri. Courtesy of ESO/G. Coleman. The planet is a little larger than the Earth, and scientists have named it Proxima b. It orbits its red dwarf sun every 11 days, and it's warm enough that if there is water on the planet, it can exist in liquid form. Scientists have long thought that the keys to life are a warm, but not too warm planet, and water. This makes Proxima b a prime candidate in the search for life beyond earth. To get a better idea of what this means, VOA spoke with Alan Boss the Chair of NASA's advisory group for Exoplanet exploration. He says the discovery of Proxima b adds to the mounting and 'astounding' evidence that there are a lot of earth-like planets out there. More than even the most optimistic scientists could have ever hoped for. A bit of backstory: in 1961 radio astronomer Frank Drake showed some very speculative math to another group of scientists about how many intelligent civilizations should be hanging around in the Milky Way. It's called the Drake equation and it's just a series of estimates that begins with a single number: how many stars are born in the Milky Way each year. Drake said it's about 10 a year, which gives an estimated 250-500 billion stars in the Milky Way. From there Drake suggested that only a tiny fraction of those stars have planets around them, and a tiny fraction of those planets might support life. Each fraction gives a smaller and smaller number until we come to the final value we can use to estimate the number of intelligent civilizations like ours out there in the Milky Way. It's speculative, but astronomers have been using telescopes like NASA's Kepler, and a host of other tools to try to put some flesh on the bones of Drake's list of unknowns. Kepler, for instance measures the tiny decreases of light that happen when a planet goes in front of its star. It's been looking for earth-like planets for years and as recently as 2013 scientists best guesses suggested that there are about a billion "Earths" out there. Scientists refer to the number of possible Earths out there as "eta-earths", and it's one of the factors in the Drake equation. Proxima b not only confirms the discovery of a new planet, but according to Boss jacks up the number of "eta-earths" by a huge amount. "Eta sub Earth is close to unity," Boss told VOA. In math, unity means one. What Boss is saying is that it's possible, even likely that most stars may have at least one earth-like planet orbiting their sun, "which is astounding," he says. "Even the most optimistic of us would never guess 20 years ago that eta sub Earth would be that high." So from early estimates of a billion, this new work suggests there may be as many possible Earths as there are stars in our galaxy, anywhere from 250-500 billion. Which makes the possibility of life increasingly likely. In fact, Boss says he believes human beings will prove that life isn't unique to earth in his lifetime. "I am 65," he told VOA, "but I expect to still be alive when it happens." In that sense it's not just the discovery of Proxima b that's important. According to Paul Butler from the Carnegie Institute "the discovery of Proxima takes us from this vague fuzzy statistical abstraction, where we think potentially habitable planets are common, and makes the case concrete. " The confirmation of Proxima b was made by a team of astronomers that called themselves The Pale Red Dot Campaign, led by Guillem Anglada-Escude' of Queen Mary University in London. The campaign got its name from Proxima Centauri itself which is a Red Dwarf, a "pale red dot" in the sky. The project looks for planets near Proxima Centauri based on a tiny back-and-forth wobble in the star, possibly caused by the pull of an orbiting planet. VOA spoke with Paul Butler from the Carnegie Institute, who worked with Englada-Escude' on a new program for the HARPS spectrograph on a European Southern Observatory’s (ESO) telescope that made the results much more sensitive. Using the new program the team was able to find this wobble in the Red Dwarf. From there Butler says The Red Dot team used the "HARPS to observe Proxima Centauri at the end of the night, every night, from January through March of this year. To get an idea for just how tiny that back-and-forth wobble is, Proxima Centauri approaches the Earth at a leisurely pace of about five kilometers per hour, and then it moves away from Earth at the same speed, repeating the cycle every 11.2 days. Proxima Centauri wobbles about 120 kilometers either towards or away from Earth every 24 hours. Astronomers using the HARPS spectrograph were able to detect that wobble from about 45 trillion kilometers away. But they still weren't sure. The astronomers were afraid the observed wobble could just be the star's natural changes in brightness. So they did more work with the ASH2 telescope in Chile and the Las Cumbres Observatory Global Telescope Network until they were sure that Proxima b really is there. For Butler, "This is the culmination of 30 years of work." So what now? Proxima b is only 45 trillion kilometers away? Can we go and check it out? Boss says we might be able to get a robotic spacecraft there, equipped with a camera in about 50 or so years, if we were to leave tomorrow. Of course, to do that we would need to get a spacecraft moving really fast, about 10 percent of the speed of light. But once the probe is there, the pictures could come back at the speed of light so its possible the next generation might see the first pictures of a planet beyond our solar system. For the moment, Butler says the discovery of Proxima b is world changing.